Imagine driving through a vineyard of concord grapes and butterfly gardens to arrive at your campsite overlooking a lovely river valley and rolling hills, entering your spacious bell tent set up with comfy inflatable beds complete with linens and cozy quilts, unique vintage furnishings, some soft, natural lighting enhancing the beautiful color of the tent. Someone has already prepared your campfire, ready for your s’mores or hot dogs. You spend the night under the stars, surrounded by the sounds of nature- maybe an occasional Hoot Owl too. 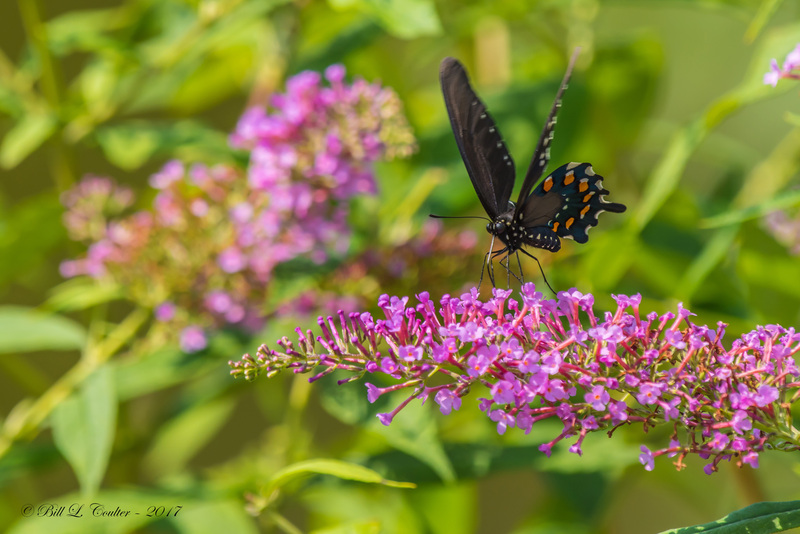 The next morning you awaken to the music of the country; chirping birds, the business of the ducks and chickens as they scour the butterfly gardens for bugs….you enjoy an early cup of hot coffee with your morning walk through the Meditation Meadow or the Cottage Garden. A delicious fresh country breakfast on the wraparound porch awaits you at the main house. When you check out to enjoy the rest of your journey, you leave Hoot Owl Hill completely rested, refreshed and renewed. We take the “rough” out of “roughing it!” If you love being outdoors, but you’ve resisted going camping because you wanted to avoid the equipment expense, sleeping on hard lumpy earth, using nature as your bathroom, having to purchase a specialized cooking setup, hauling food and water, then Glamping will get you there without the hassle. Glamping=Glamorous Camping. If you’re looking for a country respite, Hoot Owl Hill is for you. We will do our best to design an event or getaway that’s personal and memorable. 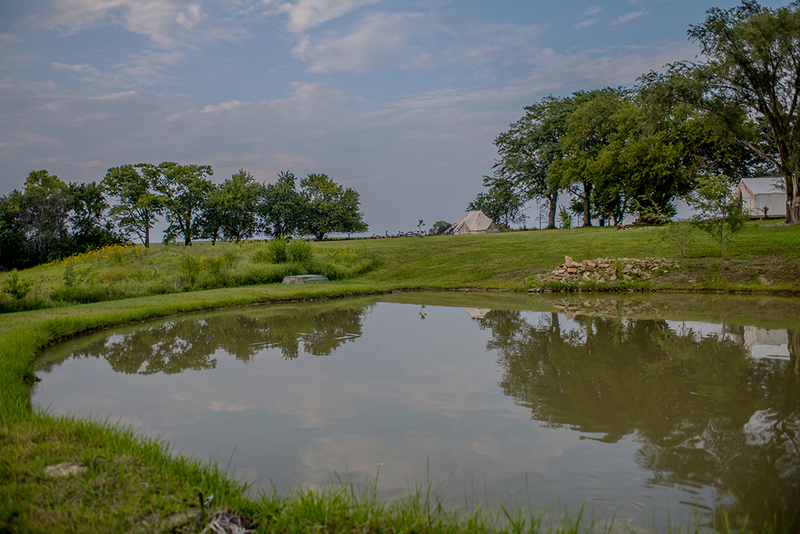 Hoot Owl Hill is a place to relax with your friends by the light of a lovely campfire, under a big Kansas sky. We love that, and so will you. The Hill awaits. Come, breathe, and just Be. 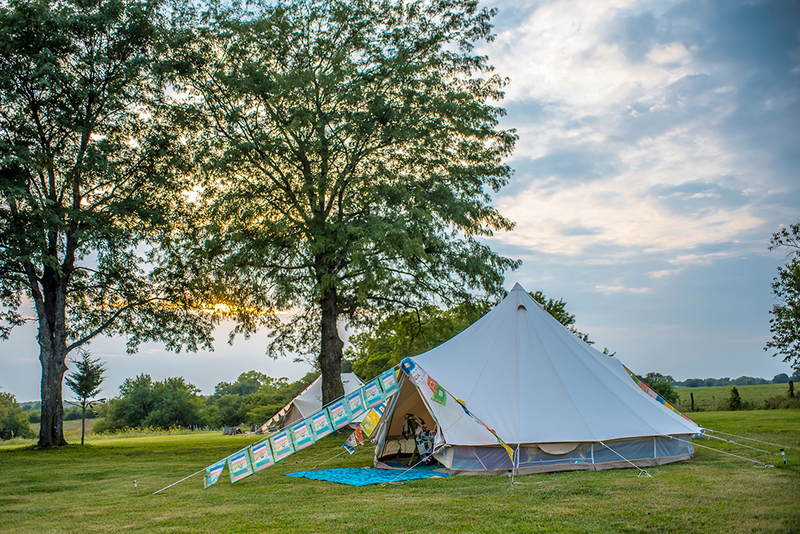 We have four tents that hold up to 4-5 queen sized beds each and two tents that hold up to 3 queen sized beds. We always assume that everyone wants their own bed, but sometimes people want to double up. We try to separate groups so that they can have their own campfire pit if at all possible, but the only exclusive fire pit is the Hoot House. To reserve, a 50% deposit of the total price is required. 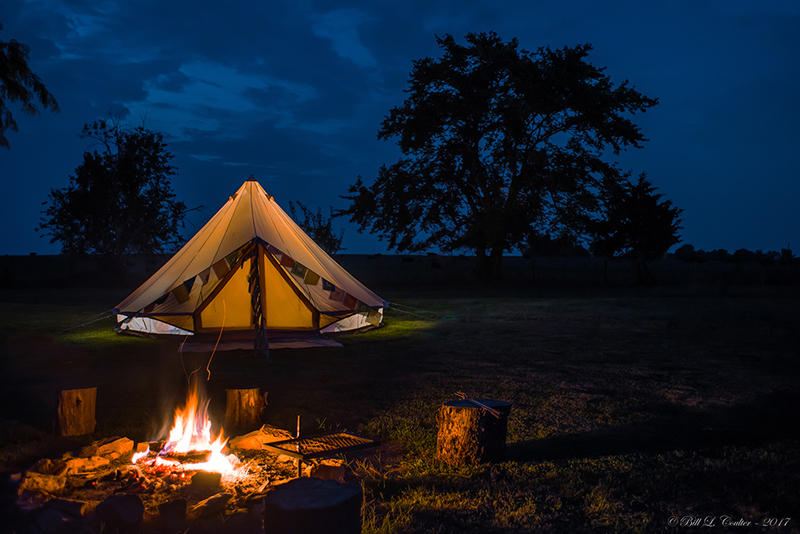 The HOot HOuse is a 16 X 24 canvas wall tent cabin, equipped for cooler weather glamping. It holds up to 8 queen-sized beds, so it’s perfect for larger Glamp-a-thons! Pitched on wooden platform, the Hoot House feels more like a cabin than a tent and is outfitted with rugs, furniture, lighting, and cozy inflatable beds made up with fun bedding and pillows. 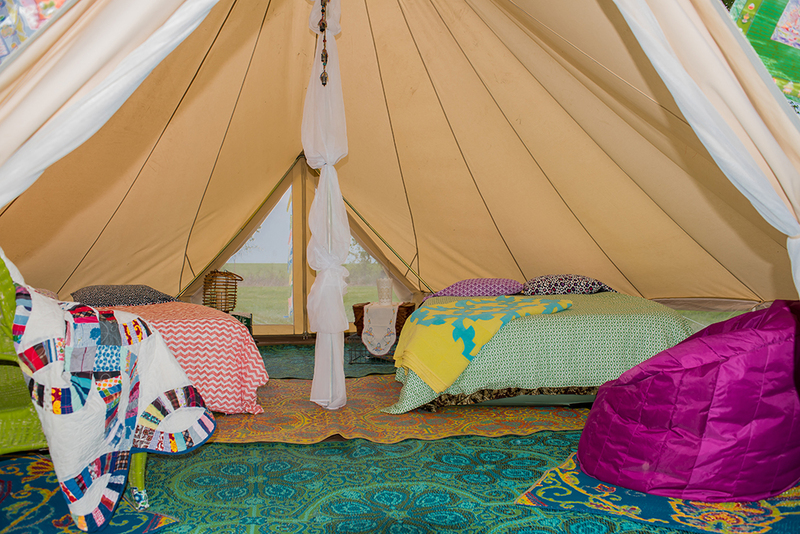 Just like our bell tents, there’s Glamptastic deco going on both inside and outside, and the Hoot House has it’s own exclusive fire pit dedicated to those guests only. There is a minimum number of 6 required to rent the HOot HOuse and breakfast is included in the per person price of $125.00. Sales tax is not included. The parking area is clearly marked and space is limited. Please try to carpool if you are coming with a large group. You’ll enjoy a short walk from your car to your outfitted camp site and we’re happy to help you haul luggage. Just like any other outdoor adventure, try not to pack more than you can carry! Check in starts at 3pm. Arrivals earlier than 3 pm and after 7pm are by arrangement only. Check out is no later than 10am on your scheduled departure day. Need more time? Ask and we’ll see what we can do. Smoking anything, anywhere is strictly prohibited on our premises or in our tents. We take pride in being smoke free and fresh, so if you do smoke anywhere on our property we’ll have to assess a minimum $250 fee. As a guest, you also promise to take really good care of everything we’ve got and understand that if your use of our premises results in any excessive wear, tear, or damage, you’ll have to make it right. You’ll be entering the great outdoors and will accept some inherent risk with your adventure including chiggers, ticks, and unpredictable conditions(we can’t control the weather can we?) 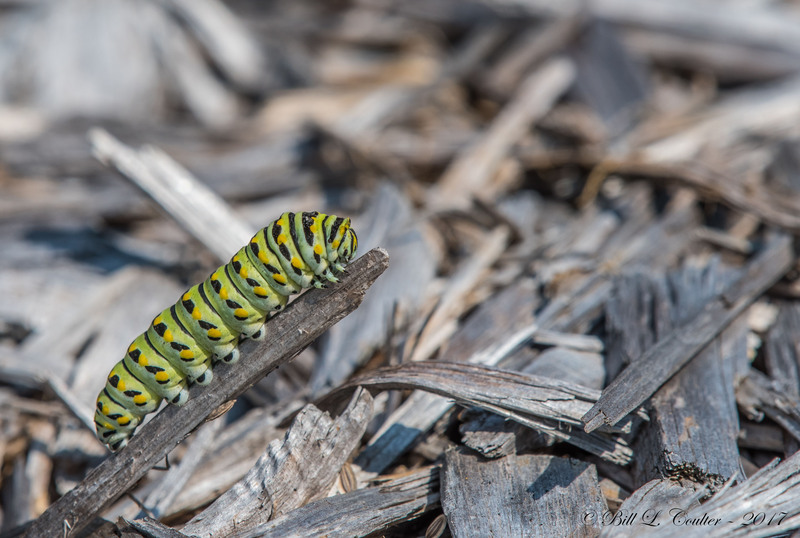 Come with an open mind, and some bug spray. Our indoor bathrooms are for indoor guests only. There is a nice, clean porta potty available for Glamping guests. We have a charming shabby-chic outdoor “bath” area complete with towels and hot/cold water for your convenience. We love peace and quiet and so will you and your neighbors. Please be respectful and use your inside voice while enjoying the company of your pals – especially after 9pm and before 8am. 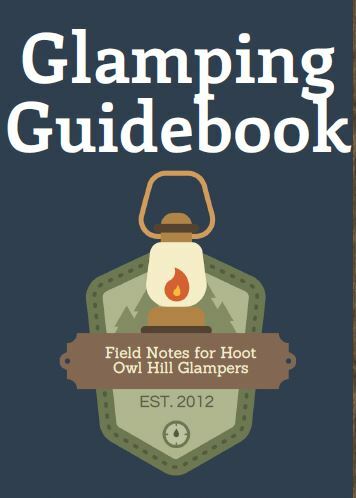 You are welcome to bring your own alcoholic beverages to enjoy with your Glamping experience at Hoot Owl Hill. Although we realize that we have no control over your alcohol consumption, we kindly ask that you self monitor your intake so that you remain safe and aware of your surroundings at all times. We reserve the right to ask you to leave our property should you become a nuisance to others-and us. If we deem it necessary, we will arrange transportation for your safe transportation home, at your expense. You will not receive a refund. The grounds of Hoot Owl Hill are for the enjoyment of registered guests only. Please do not invite outside guests to the property without prior approval. 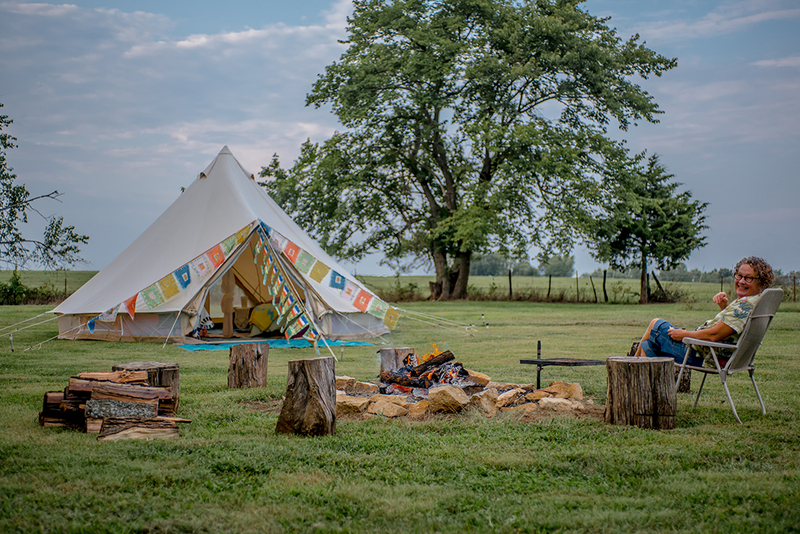 We confirm your reservation when we receive a completed and signed Glamping agreement with liability waiver, and upon processing payment for 50% of your stay with us. We will process your remaining balance on the day that you check in. Cancellation Policy: If you cancel your reservation (21) days prior to your scheduled arrival, we’ll refund half of your advance deposit as a cancellation fee. If you cancel your reservation within (21) days of your scheduled arrival, we’ll keep your entire advance deposit. If you leave before you were scheduled to, we are unable to refund you. We will do our best to work with you to reschedule your event and transfer your deposit; it will be up to our discretion to do so. We won’t share your information with anyone for any reason but we may send you e-mail messages to share news of our specials and events. Please notify us if you’d rather not receive these messages. 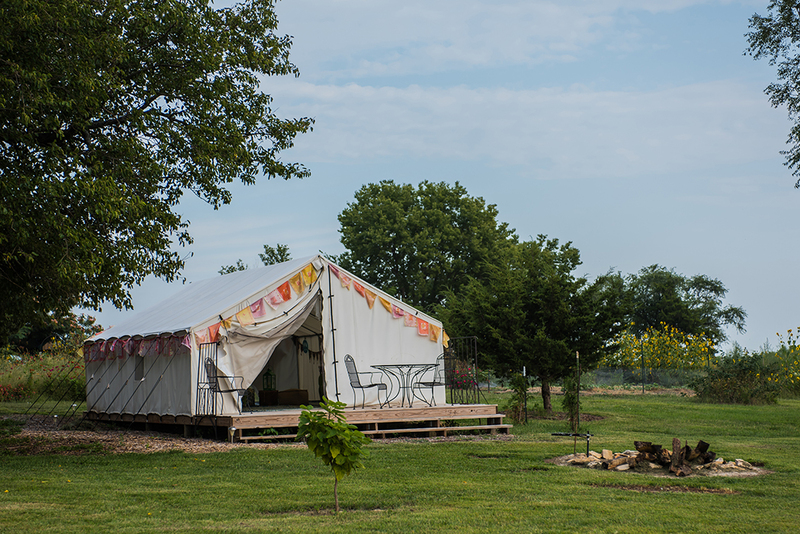 Our Glamping business is a camping Bed and Breakfast, so breakfast is included with every glamping experience. Overnight rates are $99.00 per person per night + Miami County sales tax. Due to the fluidity of our reservation demand and the limited number of openings reservations are on a first-come, first-served basis. We are unable to hold spots and will secure your reservation ONLY with a completed, signed agreement and a deposit of 50% of the total. If you cancel your reservation (21) days prior to your scheduled arrival, we’ll refund half of your advance deposit as a cancellation fee. If you cancel your reservation within (21) days of your scheduled arrival, we’ll keep your entire advance deposit. If you leave before you were scheduled to, we are unable to refund you. We will do our best to work with you to reschedule your event and transfer your deposit; it will be up to our discretion to do so. Under Kansas law, there is no liability for an injury or death of a participant in a registered agritourism activity conducted at this registered agritourism location if such injury or death results from the inherent risks of such agritourism activity. Inherent risks of agritourism activities include, but shall not be limited to, the potential of you as a participant to act in a negligent manner that may contribute to your injury or death and the potential of another participant to act in a negligent manner that may contribute to your injury or death. You are assuming the risk of participating in this registered agritourism activity.